Population loss continues to be the number 1 problem for Warren and Trumbull County. Probably about half the county loss came from Warren. The following article is reprinted from the April 1, 2018 edition of the Tribune, with their permission. 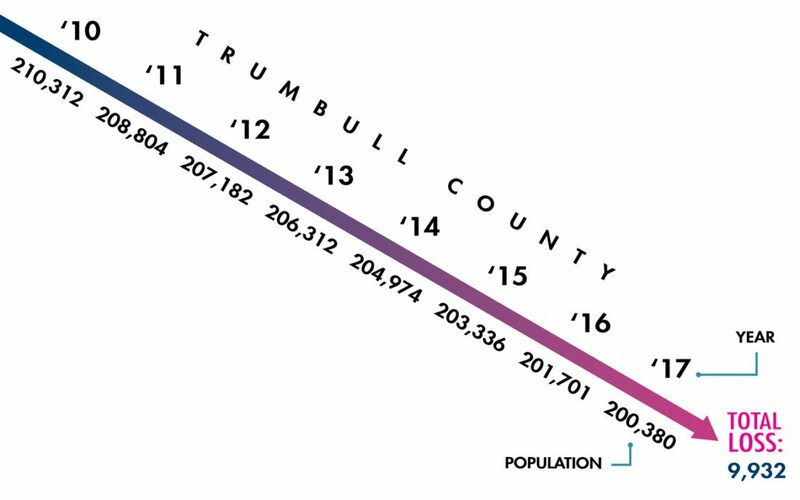 Trumbull County has seen a population decline of nearly 10,000 people since 2010, according to data released by the U.S. Census Bureau. Between April 2010 and July 2017, the county population dropped from 210,312 to 200,380 — a loss of 9,932 people. Trumbull County is one of 60 of Ohio’s 88 counties — including Mahoning County — that saw population declines in that period. Mahoning County lost 9,027 people, the data states. The most recent numbers released by the U.S. Census Bureau deal with county population statistics and do not break down the numbers by individual community. The data also doesn’t address reasons for population changes. Trumbull County Commissioner Mauro Cantalamessa said the face of the Mahoning Valley has been changing for quite some time because of the loss of industry. There is no easy solution or quick fix, Cantalamessa said. “We are trying in the process to redefine ourselves as an area and move away from that Rust Belt mentality and into a more technical jobs focus,” Cantalamessa said. However, Trumbull County may be experiencing “brain drain” like much of the rest of the state, with young people going to college and not returning to the area, Cantalamessa said. The solution to keeping grads in the area is to provide good jobs with good pay, he said. Other factors also play into it, Kim Calvert, vice president of marketing and events for the Youngstown Warren Regional Chamber, said. From 2010 to 2017 there were 8,616 more deaths than births, with 44,683 people dying in Trumbull and Mahoning Counties in that time compared to 36,067 births, according to data from the Ohio Department of Health. Posted Monday, April 2nd, 2018 under Economic development.